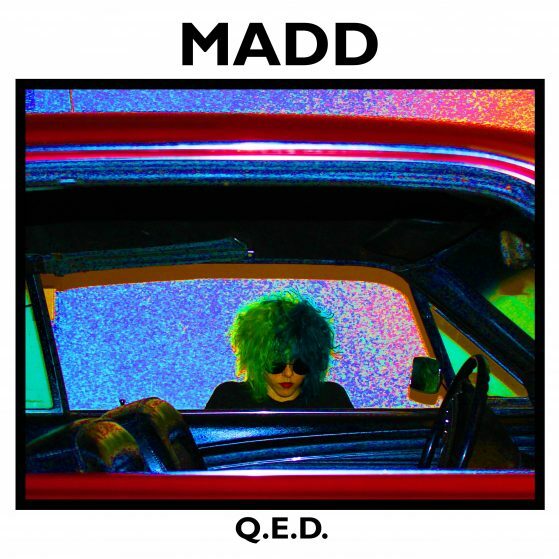 QED is Madd’s debut album. On this album Madd demonstrates her talents as a song writer, composer, and musician as she wrote all the music, arranged all the songs and plays the banjo, mandolin, bass guitar, synthesizer and both acoustic and electric guitars. She relayed on good friend Clay Hawkeswood for his drum talents. What’s in a name? Well, in the case of Electric to Inept, quite a lot. There is something wonderfully unhinged in the cocktail of musical genres that Maddi Gruber – aka Madd – mixes here. Q.E.D from which this track is taken has to be one of the most eclectic albums you will find doing the rounds today, not only taking in a range of different styles and genres but cross hatching and gene splicing a few of its own along the way. It’s rock for sure, but more a visceral, wailing garage rock vibe than the usual conventions, seeped in belligerent, sneering punk vocals and psyched out, post-punk clattering chaos, throw in a soaring metal vocal style and you have something unique. You can see what’s going on, yet the way that it wilfully doesn’t quite fit together is not only its charm and selling point but what makes it stand out from the pack, the greatest skill here being her ability to reign everything in just enough to stop it all careering off into the abyss. And after all, anything which sounds like Thee Hypnotics having a nervous breakdown has got to be worth listening to!